CVT stands for continuously variable transmission. This type of transmission allows for a change in ratios without stopping or disengaging the gears. Most CVT's are friction drive, with some means of varying the relative diameters of the driving components while driving. These friction drive transmissions are simple, but can only transmit a limited amount of torque before the wheels start slipping. There are some CVT's that use gears and cranks that offer positive drive without a chance for slippage, but these are much more complicated. 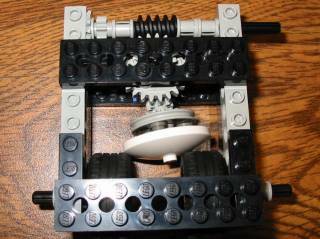 My Lego CVT is a friction drive assembly, and it is really just a quick concept that wouldn't be very practical in real applications. These pictures show the full range of the white disk. 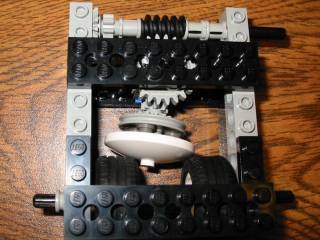 One of the wheels is the input, and the other is the output. The speed of the output can vary from much slower than the input speed to much faster. Sounds real technical doesn't it? I didn't bother calculating the exact ratios. The only trick was finding the approximate center of curvature of the white disk. This is so it can remain in contact with the two wheels as it is rotated to vary the speed. Revised: May 16, 2002 .